Christos Tsogias – Razakof was born in 1993 in Thessaloniki, Greece in a musical family. His father (musician of the State Orchestra of Thessaloniki) introduced him to music theory and gave him his first oboe lessons. He continued with higher level theoretical lessons at the New Conservatory of Thessaloniki with professors Nikolao Solomonidi and George Themelis. He entered the Music School of Thessaloniki in 2005 and received full scholarship in 2009 to continue his studies at the Greek College of Thessaloniki. He graduated in 2011 and was then accepted at the Music Department of the Ionian University in Corfu with professor Spiros Kondos. He participated in the Erasmus program from September 2013 to June 2014, which took him to Vilnius to study at the Lithouanian Academy of Music and Theater with oboe professors Robertas Beinaris and Eugenijus Paškevičius and Dr. Indrė Baikštytėas as his chamber music professor. 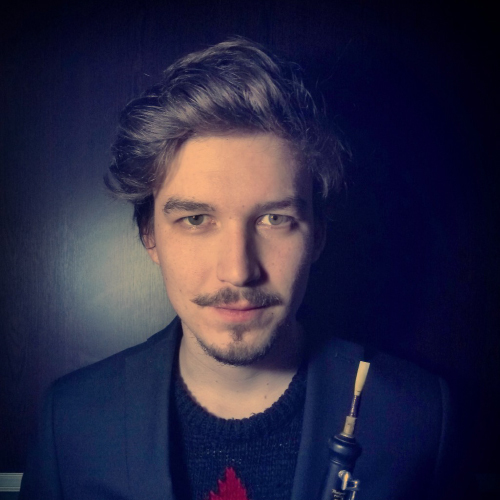 Since September 2014 he lives and studies in the Hague (Netherland) next to internationally acclaimed soloists Alexei Ogrintchouk (Principal oboe of Royal Concertgebouw Orchestra Amsterdam) and Karel Schoofs (Principal oboe of Rotterdam Philharmonic). He has also started taking english horn lessons next to Ron Tijhuis (solo–english horn of Rotterdam Philharmonic). He is currently a post graduate student at the Royal Conservatoire of the Hague with full scholarship from the Alexandros S. Onassis Foundation. He has participated in numerous events, venues, chamber music ensembles, student and youth symphonic orchestras. Since 2018 he is member of the Antwerp Youth Symphony Orchestra (Belgium) and of the Greek Symphonic Youth Orchestra under director Dionysis Grammenos. He has received many top prizes and has participated in many masterclasses with distinguished musicians like Maurice Bourgue, Heinz Holliger, Thomas Indermühle, Diethelm Jonas, Jacques Tys, Hansjorg Schellenberger, Omar Zoboli and Bart Schneemann.